If you’re already in the UK and thinking about starting a degree at Buckingham, you’re not alone. 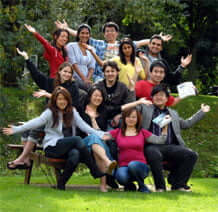 Many of our international students were already at a UK institution before joining the University. The International Office regularly visits language schools and pathway providers to counsel students about the application process at Buckingham. We also attend various Higher Education fairs across Britain. We strongly recommend that you visit our campus, where you will be given the opportunity to meet with the Admissions Tutor. Many departments also hold open days from time to time where you can find detailed information about the courses and speak to current international students about their experience at Buckingham.The International Office can help with arranging your visit so please get in touch. If you are in the UK on a Visitor Visa you will need to return home to obtain a Tier 4 visa. If you are in the UK on another type of visa it may be possible for you to make a Tier 4 visa application in the UK. You are welcome to apply for a place to study through UCAS or by completing our Online Application Form. If you have any questions about the University we would be delighted to hear from you either by telephone: +44 (0) 1280 820155 or email: international-office@buckingham.ac.uk.